A strip of riparian woodland along the Mattole River. 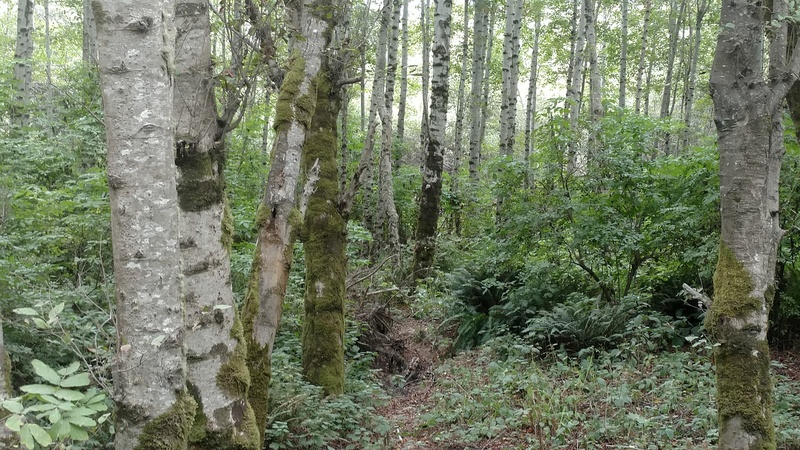 This is the first of several posts detailing my recent field trip to the Mattole watershed. Note: some of the names of the persons featured in this series have been changed to respect their privacy. It is now almost one month since my trip to the Mattole watershed, and it is high time I wrote about it. It is also an experience I would like to relive, although it did not start out that way. 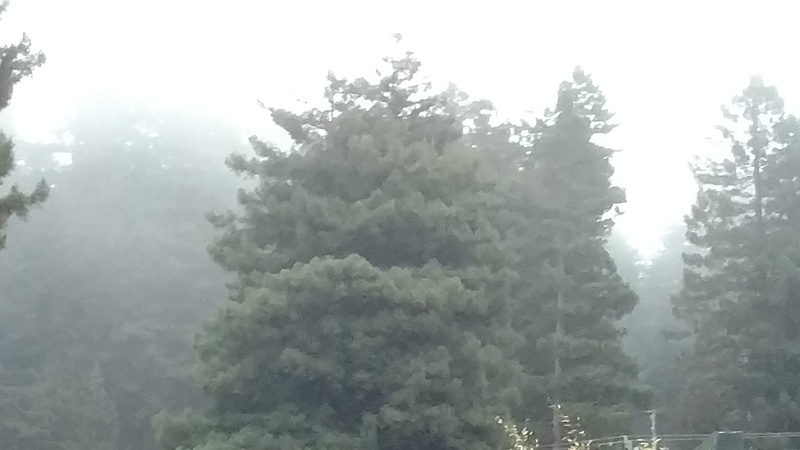 While sitting in the parking lot of Humboldt State University’s forestry building, all I wanted to do was sleep. It was about 6:30 am, and the trees of the nearby Arcata community forest were cloaked in the same fog that enveloped my mind. My cohorts trickled in, and their pleasant conversations helped to counteract my grumpy mood. 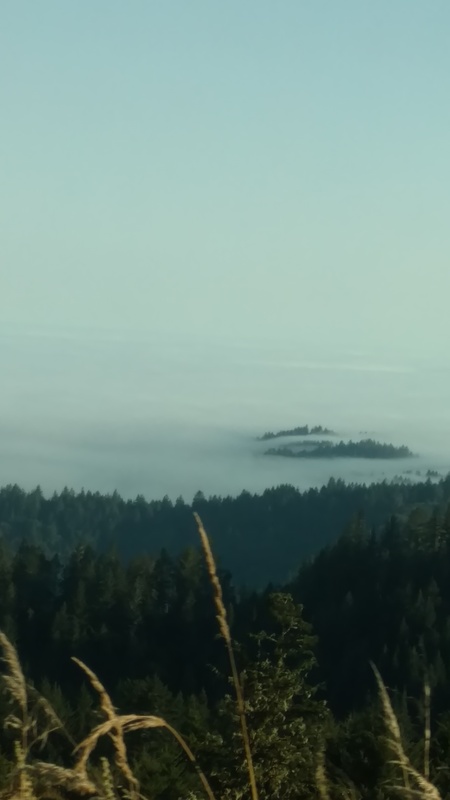 Fog permeating the edge of the Arcata Community Forest on the morning of August 15, 2016. Shortly after 7 the thirteen of us were comfortably seated in our two vans and on our way to the town of Petrolia. We passed by fog-drenched pastures, coastal mud-flats exposed during the low tide, and the oft maligned city of Eureka. I had frequently been warned about that city, and I am afraid that those conversations had biased me against it. Therefore I was relieved when we reached a stretch of road known as the Wildcat. There was no shortage of spectacular views on this trip! The Wildcat lived up to its name. The first stretch of the road was surrounded by lush greenery on both sides, and it aggressively wound back and forth as it gained height. After some time we left the dense vegetation behind and entered semi-open ranch land, and were immediately rewarded with stunning views. A glance to our right allowed my cohorts and I to gaze upon the fog-covered lands below. The road continued to wind; though now an up-and-down element was added to it, and for a brief spell visibility was greatly reduced by thick fog. But for most of the time our eyes were free to take in the rugged scenery – and I thoroughly enjoyed speculating about what sorts of creatures I might encounter there. We did pass by a pair of zebras, after all! Eventually my imaginings had to be put on hold, because we reached the Mattole Restoration Council’s office in Petrolia. The rural town had a sleepy feel to it: no doubt enhanced by the unwelcome chill that struck me as I left the van. Thankfully we were back in our warm vehicles after a short conversation with Flora, the multi-talented woman who had organized much of our week. We were now on our way to the headquarters of the Mattole Salmon Group. 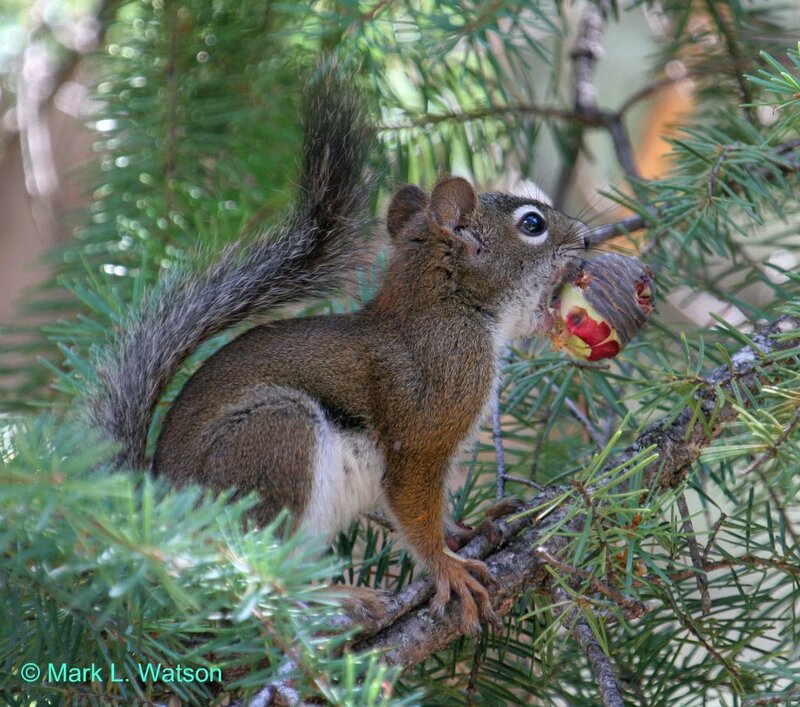 Before long we left the squirrels behind, as we had an agenda to follow. Nathan, a hydrologist working with the MSG, led us through a narrow riparian woodland hugging the banks of the Mattole. Upon reaching a patch of sand alongside the river, he began to tell us about the habitat restoration work the MSG has been doing. They have been inserting trees and wooden structures into the river, since overenthusiastic restorationists had removed too much of the debris that young salmon (fry) rely on. They had also carved out a pool off the side of the main river where the fry can take refuge. It was delightful to stand on the banks of the Mattole, but once again we had places to be. A pool off the side of the Mattole River designed to give fry a place of refuge. Gazing out at the mouth of the Mattole River on August 15, 2016. If you look closely, the distorted image of a tiny fish is visible near the center of this photo. Upon returning to the building which houses the Mattole Restoration Council, my cohorts and I took a much-needed break for an outdoor lunch. Shortly thereafter we were joined by Dulce of the Mattole Valley Family Resource Center. She explained to us some of the challenges facing her community: lack of funding for social services, transportation difficulties, soaring land prices as a result of a boom in the marijuana industry, and more. Several more local residents joined us at 1 pm, and they delved into greater detail about the obstacles they have to overcome. The recent explosion in marijuana cultivation came up again, as did factors associated with Petrolia’s remoteness. For example, it takes law enforcement nearly an hour to reach the town.² The region’s history as ground zero for the domestic war on drugs might also make people wary of the police. Despite the prevalence of negative topics during our discussion, the forum was a joy to be apart of. My cohorts kept asking insightful questions, and the community members fed off each other’s energy. Based on the passion and commitment displayed by those individuals, I left feeling optimistic about Petrolia’s future. The cows mooed in agreement. The need to at least appear to be paying attention partly explains why I took so few pictures during this trip. I was also relying on my cell phone, since I do not have a stand-alone camera. This was off for most of the trip to conserve power. I cannot recall the exact time that was given. If anyone who was on the trip is reading this post and believes the one hour figure is wrong, feel free to tell me. The same goes for any other errors I might have made. Human memory is falible, after all. Thank you. Reminds me of my trip to British Columbia a couple of years ago – before I was blogging. I’ve never made it up to British Columbia, but I’ve been in areas in the state of Washington that have a similar climate. Truly incredible forests! Una de las cosas que más disfruto de esa clase de viajes, es hablar con la gente del lugar, porque te da otra perspectiva de la problemática que tal vez no se te había ocurrido, y el intercambio de ideas es muy bueno. Jajaja sí, las ardillas son muy divertidos mirar! Sí, fue muy informativo hablar con la gente del lugar. Nunca he vivido por un largo tiempo en un lugar tan remoto, así fue bueno para mi oír sobre los retos que esas personas tienen. Ahora tengo much más respeto por la gente que viven en lugares rurales! Ellos tienen que confiar en sí mismos mucho más que la gente que viven en las ciudades, y tienen que trabajar duro. Pero como un premio la gente que hablé con pueden vivir en un lugar muy hermoso! Gracias por tu apoyo! :D Besos a ti también! Si, tenés razón :) Además vivir desconectados de todo a veces tiene su lado copado! The place is incredible, and not just because of the landscape. I got to meet lots of friendly, welcoming, and inspiring people on that trip, and hopefully you’ll get to read about them soon. However, I think the most beautiful place I’ve ever been is a retreat center in Central Washington called Holden Village. You should look it up! You live in India, right? You might have even more beautiful places near you, especially if you live near the Himalayas. I’d recommend trying to see if you can visit someplace up there too! I just looked at some pictures of Shimla, and it’s beautiful! The scenery actually looks pretty similar to Holden Village’s, since they’re both located in the middle of a mountain range. But Holden Village is much smaller and more intimate than Shimla seems to be: especially if you go there in the Fall. I was able to go in October, and there were very few other people there. I should warn you though, Holden Village is a very Christian retreat center. I didn’t feel uncomfortable there, and I’m not religious, but I wanted to let you know that just in case. I too looked up the images of holden village!! Its indeed a very beautiful place. I guess all the hilly stations have a similarity in their structure and planning. The dehradun, mussoorie regions, the tibet border…..they also look a lot alike. Lol thanks for the heads up, yeah some places can get very conservative and religious…. we too have a few temples here, they can get tough on some other religions….as well as on some specific castes of Hindus. Even though its changing day by day….. I read the article you sent the link of, its such an exciting course!! Must be wonderful to read about so many places and also get to do field work!! Really cool :D :D And an integrated undergrad and post grad degree is also very helpful. It’s definitely an exciting course! I joined too late to take advantage of the integrated undergrad and grad degree, but it would definitely help students who are able to take advantage of it.